QUESTION: Discuss how you judge a missed change, a late swap, a skip behind, versus landing on the correct lead after every jump. Are you more critical of these errors in a Pre-Green class versus an Amateur/Junior class? 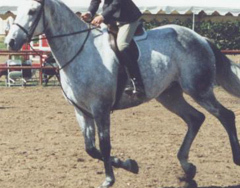 Hunters are expected to canter on the correct (inside) lead and change leads as they change directions on course. Clean lead changes on-command should be smooth. However, lead changes can come in varieties… a switch in front before the hind (“disunited”) or with a quick trot step prior to changing. The judges comment on their preferences and their expectations for less experienced horses in the green divisions versus the veteran horses competing in Junior/Amateur classes.